Across the country local and state DOTs are investing heavily in multimodal infrastructure in an effort to ease traffic congestion, lower CO2 emissions and improve air quality in their communities. With new bikeways, lanes, trails and paths coming online or in construction, many cities and states use the National Bike Challenge as a way to rally and engage their communities to ride. Love to Ride helps to encourage and grow ridership while gathering valuable rider and trip data. Increase Ridership - Our proven behavior change program has proved to get more people riding, more often, and for transportation, in more than 200 cities. Gather Data - Get access to a host of data about riding in your city. Find out who’s riding (demographics), how much they ride, how they normally get to work, where they live, where they work, etc, etc. Reduce Costs - Community engagement and encouragement programs are time-consuming and require headcount, our proven and largely automated program makes rider encouragement, targeted education, and qualitative and quantitative data collection easy and effective all while cutting costs and saving you money. Targeted Communications - Promote your existing bicycling initiatives, routes, events, public consultations, etc, to existing and new riders in your area. High-Value Program - Economies of scale and cost efficiencies mean that you get a lot of value for the budget you have available. We have a range of budget options so that we can work with organizations of all sizes and budget levels. 1) Local Site – get a local Love to Ride site for your area. Unite your riding community online and give them a tool to make it easy and fun to encourage their friends and co-workers to ride too. 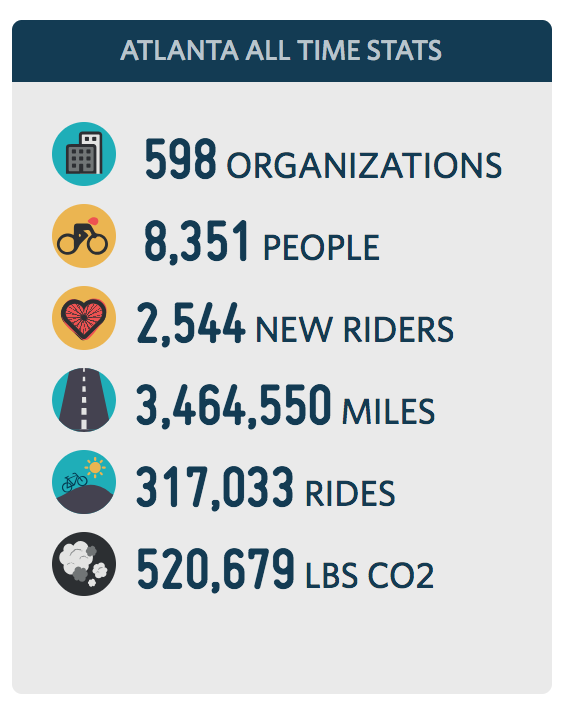 Includes site-set-up, logo, local stats (number of people cycling, commutes, miles, etc), add and edit pages/content, get local leaderboards (top riders, top commuters), clubs and groups, and more. 2) Local Site + Business Access – All the benefits of a Local Site plus local businesses have profiles (showing company stats, their internal cycling community, team messaging, data exports, company leaderboards, activity feed, photos, etc) and businesses be able to take part in our Workplace Challenges and will show up on both local and national leaderboards. 3) Local Site + Business Access + Engagement - Get additional support from Love to Ride to really grow participation and engage people and businesses in your area in the program. This includes options for us to recruit a ‘Local Project Manager’ who would work on the ground to drive participation. 4) Local Site + Custom Challenge - Want a challenge at a different time of the year? We’ve a lot of flexibility. We’ve worked very hard to develop delivery systems that making providing local Love to Ride programs very affordable. So we’re confident that we can provide you with one of the options above at a budget level that works for you. Please book time here to talk with our Partnerships Manager - Laura Cisneros. She is also available at laura@lovetoride.net and (512) 750 9584.